In previous editions of Puzzles in Pop Culture, I’ve recapped classic episodes of M*A*S*H and MacGyver, as well as the numerous puzzly plotlines that’ve been featured on The Simpsons over the years. But when it comes to erudite, hilarious references to solving crosswords, you’d be hard-pressed to find sharper puzzle-infused dialogue than the moments featured in episodes of Aaron Sorkin’s landmark political drama The West Wing. 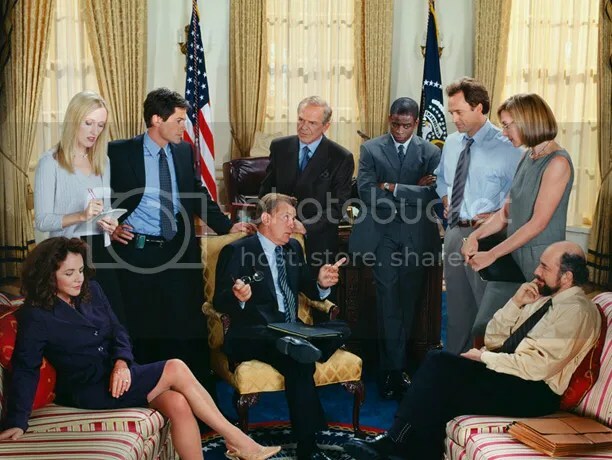 Set in the West Wing of the White House, the show focused on the lives of the president and his advisors and staffers as they navigated political situations at home and abroad. To this day it’s a regular feature on most reviewers’ lists of the top television shows of all-time. And in a show noted for sparkling wit and all kinds of intellectual wordplay, it’s hardly a surprise that the New York Times Crossword was referenced in the very first episode. Beyond the spirited humor of both scenes, there’s a marvelous undercurrent of how smart people react when their intellectual superiority is challenged. Leo responds by trying to correct what he sees as an egregious error, while the President bends the rules to suit his own expectations. Even as subplots in a much-larger narrative, these puzzles added color and personality to scenes that took us inside the minds of these characters. Pretty impressive for crosswords that are only mentioned briefly.